High cards - 10s, Aces and face cards - would be good for you, while low cards - from 2 to 6 - would be bad. By keeping the right good card to bad card ratio, you can assess whether the upcoming cards will be good or bad for you. A lot of people mistakenly believe that counting cards needs great intellect or photographic memory, but this isn't true. Although the initial developed systems of card-counting were hard to apply and clumsy, they evolved into easier methods quite fast that now surpass their predecessors when it comes to overall effectiveness. Now, before starting, it would be highly recommended to do some research first. There are various legitimate systems of card-counting out there today - from simple unbalanced systems of counting to harder multi-level systems of counting that come with different side counts. 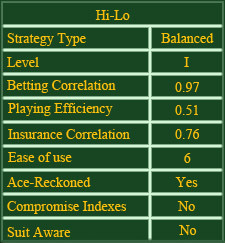 Read on to learn about the Hi/Lo system, which gives the greatest balance of simplicity and power while having the best extension durability for highly powerful strategies at the same time. This Hi/Lo system assigns card values to the following cards: low cards from 2 to 6 are +1 while 7 to 9 are 0 and low cards (10s, Aces and face cards) are -1. Begin the count at 0 right after shuffling and each time a card has a value from 2 to 6, add 1 to the running count. If a card has a value from 7 to 9, don't do anything and each time an Ace or 10-value card shows up, subtract 1 from your count. The number that results from this is known as the RC, or Running Count, and shows how many additional low and high cards have already been dealt. So, whenever additional low cards are out, or when the count goes above 0, then more high cards are coming up and the deck would basically be more favorable for you overall. Now, a method would be needed, which can quantify how favorable those remaining cards would be for you. Since every additional high card inside the deck will add 0.50% to your advantage, you have to find out the amount of additional high cards that are left inside the deck in order to calculate your exact edge. This would be especially vital because today's blackjack games are hardly ever played with single decks anymore. More often, they are dealt with up to eight shoes. To find out the amount of additional high cards left inside the deck, just divide the running count by the amount of decks that are being played. This number will then be called the TC, or True Count, and will help you assess the advantage left for you inside the remaining deck cards.